I overslept again this morning. I showered, dressed, had breakfast, put on scarf, hat, gloves, left home. I walked to the bus stop, where the 26 stopped only a few minutes later. I got off at Fulton and Flushing Avenues, went down Dekalb Avenue subway station, boarded the B. I could have taken the Q, but this train came first, so I mentally adjusted my route: I would get off at 47th Avenue/Rockefeller Center and walk the rest of the way to 59th Street and 3rd Avenue. I was running late, so I couldn’t afford an alternative. This had to work. I surfaced on 6th Avenue. I had only 18 minutes to get there, so I walked fast through Rockefeller Center, stopping only for much-needed coffee. I made up for the stop by walking even faster. Shop windows, Christmas decorations, a woman in a fur coat with a hood, Saks, a jogger, the Tiffany store I had never seen “in stone” before, the girl in sunglasses and high heels – a model? – with whom I shared a crosswalk and part of the street. “I’m not going to make it, I’m not going to make it” I thought. But I didn’t slow down, I couldn’t slow down. I had a few more blocks to go – up and east, up and east. Two More Years from Bloc Party on my headphones helped to set the pace. I arrived too late. Two and a half minutes too late. As I stood on 59th Street – arms slightly open from wearing a thick pea coat, fingers apart inside Thinsulate™ gloves – I felt hopeless, disappointed, clumsy in the 31-degree cold. I had missed the 11am tram to Roosevelt Island. Forever. There is something decidedly romantic about this tramway – I thought gazing at the gondola, as it went up very high, disappearing into the cluttered horizon of Queensboro bridge, buildings and other urban paraphernalia, leaving for what was for me an unknown island. What if I wasn’t late, what if I got on the gondola? But alas – I didn’t. And I would have to wait another hour to board the next: due to haul rope tower sheave replacements, the Roosevelt Island Tramway ran hourly between 10am and 2pm on November 18th and 19th of 2008 – the two days I first tried, then eventually managed to travel on this New York transportation infrastructure. I stood in the cold, no longer gazing at the gondola, but in the small park of benches and shrubs, looking at the boarding station, its yellow railings and red elevator shaft, the cast concrete of it all, the slightly beat-up blue canopies. I went up, talked to the MTA guy inside the booth, glanced at the Roosevelt Island residents notices, wondered if the island pool was good, came down, walked around, took photographs. I remember thinking this building felt as clumsy as I felt at 11h03, as if it would always be waiting to board the elegant, red, Swiss-designed gondola but never quite made it. It was getting old too, and it showed. A 1976 temporary structure made permanent, the two gondolas + cables + stations tramway grew on New Yorkers, who did not find it redundant after the Roosevelt Island subway station opened in 1989. They rather found it, like me, rather extraordinary. At 12h02 I was up higher than the neighboring bridge, looking at the cars coming in and out of it, at curtain-walled living rooms, at power station chimneys, at Manhattan under the crisp, fall blue sky. I thought how true romance must happen in places like this, how you can find someone and fall in love during the smooth ascent, the glorious interval, the vertiginous descent into the island station. This is a truly incomparable urban experience; to be taken out of the city into the skies and back again in just four minutes shows infrastructure is a fundamental part of the city not because of what it is, but because of what it does. In this case, it’s not about its dated 1970s built structure. It’s about the unforgettable ride. After my quick ride of romantic ecstasy, I walked out of the other equally clunky corrugated iron and concrete end station, went around the southern half of the island and took the subway back to work, wondering what the rest of my life could have been had I arrived on time. 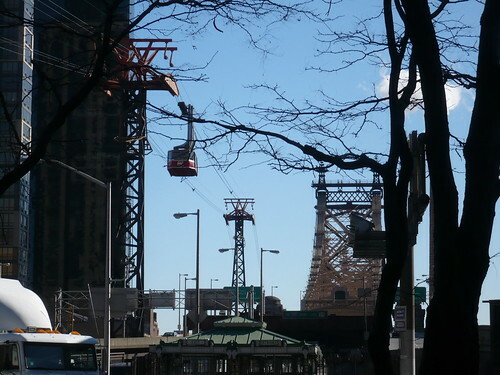 I didn’t find romance on the Roosevelt Island tramway gondola, but I fell in love with its possibility.